With so many pedigreed dough-punchers everywhere in Japan, Le Croissant comes off as the down-to-earth neighborhood bakery where people takeaway the bread and have them on the go. The hottest item is of course, the original croissant that is 100% made with Hokkaido wheat and brushed with a sugar syrup concocted in-house. The most wonderful thing about the full 8-course menu here is that it includes not 1, but 3 desserts. It's a good healthy number since most lunch/dinner courses end with only one or no dessert at all, hanging my heart (and stomach) in mid-air without a sweet ending to a meal. Opened only in end October last year, Meta is dedicated to modern avant garde cuisine without the pressure and rigidities of fine-dining. The 30-seater space is sleek, black and evokes the industrial punk vibes. Unless you wish to indulge in some lovey-dovey private space at the small tables, I figured the best position is none other than the row of bar seats, which allows a full perspective of the young rebellious kitchen team in action minus the heat, grease or what so ever that makes you feel uncomfortable. Look no further than Tokyo Asakusa for the richest matcha ice cream in the world! Yes, you are not reading wrongly. It's Tokyo and NOT Kyoto. Shizuoka's famous green tea gelato parlour Nanaya has collaborated with Tokyo tea shop Suzuki En 壽々喜園 (since 1848) to sell its famous matcha ice cream in varying degrees of intensity. I used to think that airplane meals are unpalatable or even tasteless but I now take my words back after having a delicious Kaiseki dining experience on-board the Singapore airlines business class flight from Narita (Tokyo) back to Singapore. In fact, I recalled that having similar in-flight kaiseki meal back in 2012 and looks like improvements have been made to the meals. 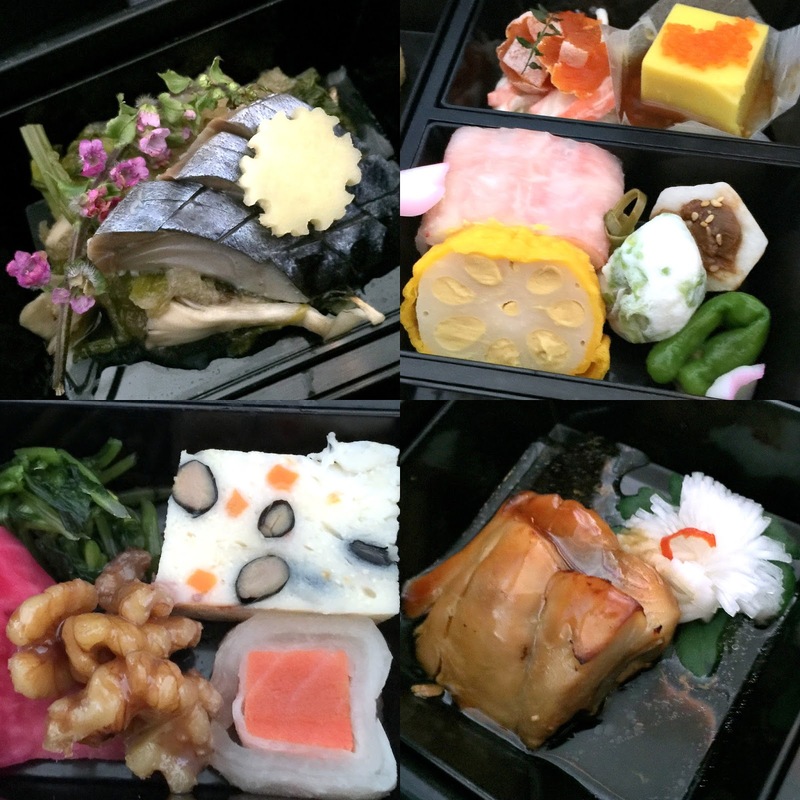 Kaiseki or any Michelin-star restaurant, is not a top priority for me when I travel in Japan. And thus, I have never been to any of the highly rated expensive spots like Nihonryouri Ryujin or Kikunoi, of course not even Sushi Jiro. I think I’ll be happier with a convenience store onigiri or excellent cakes from talented patissiers. That said, I won't say no if I have the opportunity to try a full Kaiseki course. Hence, it only took me less than one second to decide between the Japanese or the International selection this time round as the Japanese selection, Hanakoireki, was created by Yoshihiro Murata of Kikunoi Kyoto. I'm a fan of Kikunoi after learning so much of his food philosophy and passion towards preserving the traditional Japanese cuisine. Being an on-board meal, the Kaiseki course is served as two main parts rather than one dish at a time. February is the month of love, chocolate and .......strawberries. My eyes instantly lit up at the gorgeous display of pink pastries, which left me highly anticipating for the spring season after the chilly winter. Since I won't be in town for Sakura, why shouldn't I live the moment and catch the freshest strawberries when they are in season? Running from now till mid-March, the strawberry sweets is an annual affair at Fiorentina Pastry Boutique that takes full advantage of these highly prized berries when they are at their sweetest. You may have seen all kinds of matcha desserts but how about having matcha in savoury dishes? Although I have written previously about the Japanese Tea Kaiseki Meal at Fukujuen Tokyo, that experience wasn't as "extreme" as the experience at 1899 Green Tea Restaurant. As the name suggests, this place is all about infusing Japanese cuisine with "ocha". This couldn't be a more appropriate theme for this restaurant that is opened by the prestigious Hotel Ryumeikan which has more than 100 years of history since its establishment in Ochanomizu. I am a huge vegetable lover and those who have dined with me would know that I am always the one who clear up any remaining side greens on the plate. Hence, I don't run away from any vegetables or find it a chore to consume salads. Nonetheless, finding the right place that offers nutritious salads that does not skimp on ingredients has been quite a hassle until I was introduced to Spinacas, an online salad delivery service started by Phyllis Chua to busy working crowd. The concept is very straightforward--high protein, low carb salads which are great for paleo and primal dieters. Well, if the words paleo and primal sound greek to you (and to me initially), trying Spinacas salads will give you an inkling on what they are all about. Looks like BAKE has rapidly expanded its territories not only in Japan but also overseas. Nonetheless, there is always long queue for its one and only item on the menu-Cheese Tart. It's Jiyugaoka outlet is a sleek white two-storey building with cafe seats on the 2nd floor. This has got to be the best patisserie I've visited for my recent autumn trip. If you have tried Hidemi Sugino's ultra velvety mousse cakes before, then you should make a trip to Occitanial. This patisserie in Suidobashi is a collaboration between famous French patissier, Stephane Triand and Japanese patissier, Kazuhiro Nakayama. With numerous awards in global pastry competitions, Stephane Triand is another well-known figure who has received a MOF (Meilleur Ouvier de France) title, the highest French accolade given to any chef in recognition of the expertise and talent. The selection process is highly stringent and other familiar winners include Pierre Herme and Joel Robuchon. After moving from France to America to assume the role of executive chef at The Four Seasons and St.Regis Hotel, Chef Stephane crossed over the Pacific and started his first overseas outlet in Tokyo. His perfectly circle-shaped works with a glossy shine made them highly distinguishable from other pastry shops. We were joking that an angmo could come to Singapore and create a big news selling chicken rice because a Japanese father-daughter duo selling meepok instead of ramen has sparked interests as many flocked here to queue for the local Mee Pok that is cooked by Japanese. I learnt that they had learnt the ropes from Ah Hoe whose stall is also in Clementi. 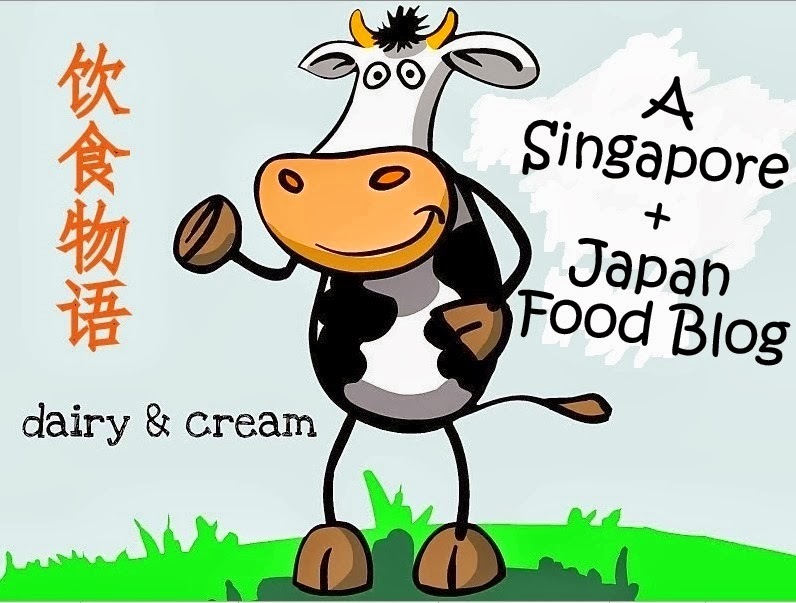 Pretty smart move since there is a significant Japanese expat population in Clementi. We queued for nearly an hour on a Saturday afternoon and finished the bowls within 10 minutes. As every culture has their own way of interpreting and mastering the cuisine, I am not surprised to learn that the owner-chef sets a timer to ensure that the noodles are cooked to the perfect timing, which is quite a common practice in some ramen-ya. I couldn't be happier to learn that Maison Kayser has opened a new outlet in Raffles place and it is just within walkable distance from my office. The swanky outlet is brighter and spacious than others, with a full glass display showcasing the pastries and bread. Immediately, my eyes were drawn to the new items such as the Kaya eclair ($6.50) which was decked in a fluorescent green frosting. 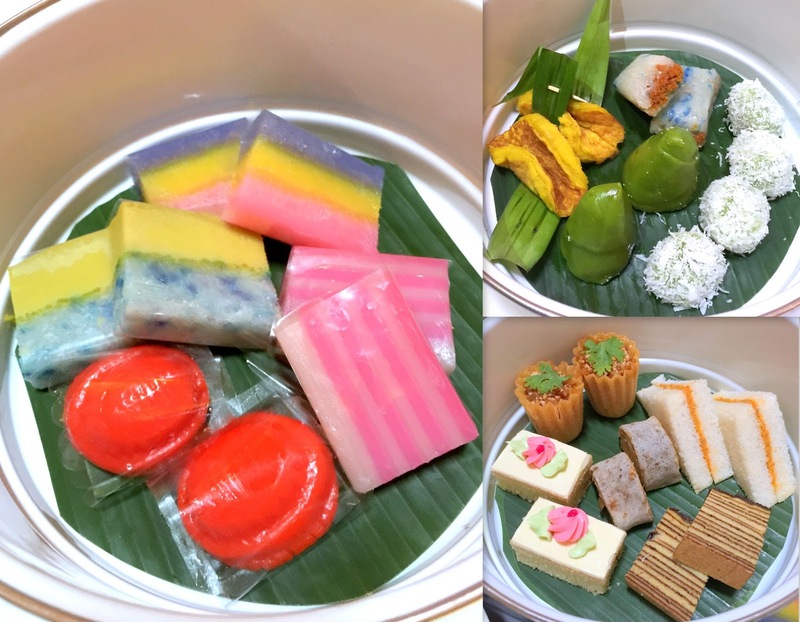 With so many Asian fusion French desserts popping up in Singapore these days, it is never too late for them to ride on the wave. This is one good eclair that is perfumed with the aroma of Pandan coconut and not overly sweet. Ever seen a pot of curry with "roti" in a hotel afternoon tea? Not for me as it was my first time having a delicious bowl of chicken curry served with artisan French baguette for a non-buffet afternoon tea. This tasty dish is part of the newly launched Peranakan Afternoon Tea at the Atrium, Pan Pacific Singapore that goes beyond traditional scones and jams. The curry gravy wasn't too fiery at all, yet so thick and richly fragrant that had me using those crisp baguette toast literally as a spoon to scoop up the wonderful goodness. The old school traditional biscuits were nice little touches that evoked childhood memories. 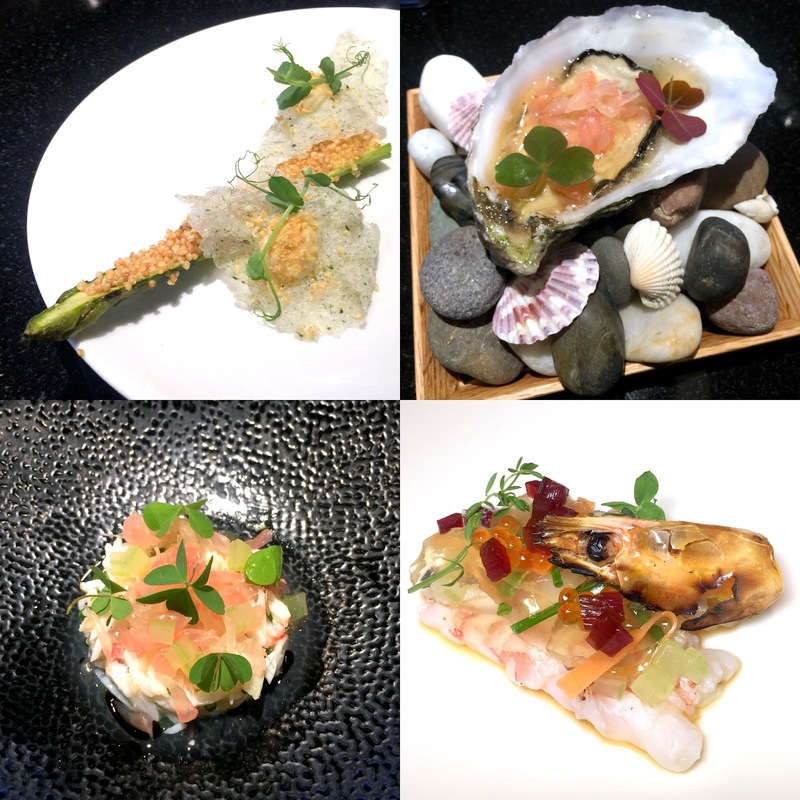 From the very first bite--a Squid ink Burrata with Smoked Salmon and Caviar to the final mouthful--invariably an epiphany burst of chestnut honey cream in a petit choux shell--dinner at Basilico unfolds with a series of unorthodoxies and witticisms. Whether it's my first or Nth visit, there is always pleasant surprises that keeps me wondering what will be coming up next. If I didn't had the menu next to me, I think I would not have touched the odd looking Orange cocoon-shaped stuff on this plate. I'm glad I avoided such a grave mistake as this was such a tasty plate of hand-kneaded Beetroot gnocchi with Boston Lobster. The gnocchi was soft, chewy and pretty cheesy, paired off with a discreet asparagus cream that smoothened the robust flavors. This is one of the new dishes on the seasonal-rotating menu of "Mari e Monti", a year-long series produced by Executive Sous Chef Angelo Ciccone and Basilico Head Chef Luca Beccalli that draws inspiration from the mountains and seas of the Italy. A dinner here theoretically goes by 3 courses of antipasti, ala carte main course and dessert but realistically speaking, it's probably 10 courses or more since it is in the style of buffet for antipasti and desserts. One of the highlights that evening was the Squid Ink Risotto that would be available for the first quarter (25 Jan-3 April) which focuses on region specialties from the Appenini Mountains in Central Italy. Though the shallot sauce seemed detached from the rice, the risotto wore fine flavors of the sea and the exceptionally tender cuttlefish exuded a lovely smokiness. Also from the same region is the Roasted Pigeon with Seasonal Baked Vegetables while the Grilled Sea Bass and Octopus will only be rolled out in the next quarter when the focus shifts to ingredients from Adriatic Sea, the East Coast of the Italian Peninsula. I prefer the fish to the wild poultry as the former achieved a better balance on flavors and textures. That dish was brightened by the Spicy Datterni Tomato sauce and roasted green olives, with a tasty crispy squid ink risotto cake. There might be plenty of elements here but the cooking was underpinned by an almost luminous depth of flavor. To conclude, we had the crispy Chestnut Honey Bigne, which was just as sweetly satisfying as the Almond Tartlet with Cherry Compote and Lemon Meringue. In fact, I was not aware that the golden cream puff had been deep-fried until after the meal. That was really heavenly. Of course, there is still PLENTY of other quality desserts to indulge free-flow as long as your stomach space permits. It is always so fascinating to see that the chefs are always thinking out of the box to create something new and exciting for diners. Yet, everything carried out so smoothly without compromising on quality. This is perhaps one of the reasons why Basilico has constantly been recognized as one of the best Italian restaurants in Singapore that promotes Italian lifestyle and culture and food. Now I'm sure you know where to head for quality Italian food.